Our gorgeous Original Wine Rack is an amazing and functional wine holder that you will easily fall in love with. It all starts with high quality, hand selected, reclaimed wood, that it is cut and assembled to produce a unique pattern on each piece. Then a beautiful color is created by a coat of stain, slightly distressed. And finally, holes are pre-drilled in the backboard, making it ready to mount in studs or drywall anchors as soon as it arrives. Once mounted, it sets your kitchen and dining area apart by adding a desirable rustic style and artisan feel that compliments most any setting. 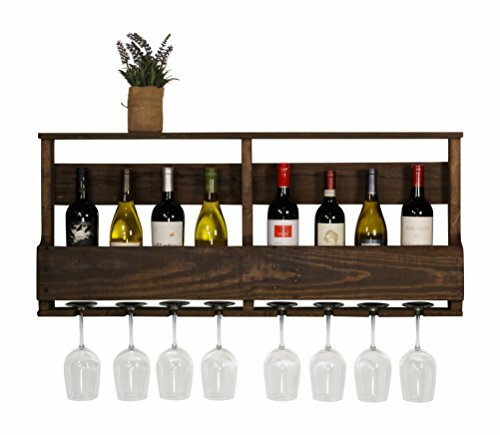 This unit is made to hold 8 wine bottles and 8 long stem wine glasses perfectly, and also includes extra shelf space for decor or more wine/glasses. Proudly manufactured and shipped in the USA. Every piece we make is its own creation because reclaimed lumber has natural variations. This uniqueness is one of our strengths and makes every one of our handmade home decor items a one of a kind. Thank you for keeping these unique traits in mind when placing your order! We also stand by our products and will happily address any manufacturing flaws or issues, simply reply to our email notifications and we will resolve it promptly.